Simple, straightforward delivery and honesty can sometimes be the best way to engage an audience. That’s the lesson Reebok’s director of digital marketing technology, Mark Whitehead, shared with attendees at the Brightcove PLAY 2011 customer conference in Boston. During the session Online Video & Brand Building, Whitehead compared two digital marketing campaigns of which he had been a part. The first was for Reebok parent company adidas, which he dubbed an “epic” big-budget campaign centering on an advertisement for international soccer star Lionel Messi and the 2009 launch of his new branded adidas cleat. 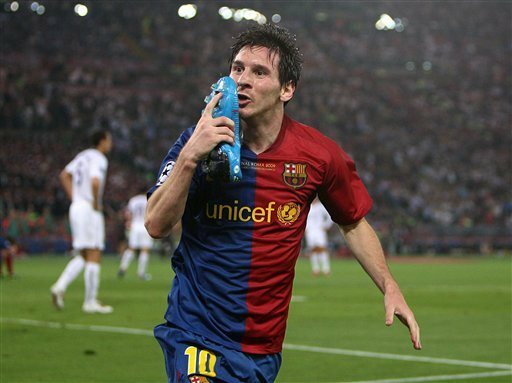 The campaign culminated in what Whitehead called a “stars-aligned event,” with Messi scoring the winning goal in the UEFA Champions League Final, running to the sideline, removing his new adidas cleat, and kissing it before a live television audience of hundreds of millions. Lionel Messi kissing his new signature shoe was a "stars-aligned event" for the adidas marketing campaign. Whitehead then described a second project for Reebok that was done more out of obligation to its legal team to dispel positive but inaccurate comments that consumers posted on Reebok’s website regarding one of its shoes. He admittedly set forth to create a piece that was “long enough and boring enough” that nobody would pay attention. The end product was a five-minute video recorded with a handheld camera in a company hallway featuring the product manager describing the shoe and what it can do. The Messi ad on the adidas website drove lots of views, according to Whitehead, but not much conversation about the new shoe. The two overriding comment themes were questions about the music and whether or not George Clooney did the voiceover. Meanwhile, much to Whitehead’s surprise, his “boring” Reebok video that cost one percent of the adidas ad generated “massive results and engagement.” Whitehead said Reebok created two more similar videos in which the company didn’t try to differentiate its products but rather “promised to tell you exactly what it does; if you buy that product you have the utmost confidence that it does exactly what we say it will do. View highlights from the PLAY 2011 session, Online Video & Brand Building. Mark Whitehead’s insights into online video and digital marketing are among the wealth of valuable information that is shared among the hundreds of digital media and marketing professionals during the PLAY conference. Brightcove PLAY 2012, taking place June 25-27 at the InterContinental Boston Hotel, is drawing Brightcove customers, partners, and digital media experts from around the world for three action-packed days of hands-on learning, in-depth strategy sessions, next-generation product demos, all-star keynotes, and networking.